Devitrification is one of the more frustrating problems that kilnformers encounter. In this article, I am going to discuss how to recognize devitrification, strategies to prevent it, and what to do when it occurs. One of the most attractive aspects of kilnformed glass is the smooth, glossy, luscious surface that we get on the top side of our fired pieces. But, at times we will remove a piece from the kiln and notice that there are areas of the surface that are not glossy, and appear to have a haze, frosting or scummy coating on the surface. It can be minimal and barely visible, or so prominent that it appears that the glass has a white crystalline coating. This haze is recalcitrant to scrubbing and washing – and appears to be a part of the glass itself. This is devitrification, commonly called “devit”. Glass is an a “amorphous solid” which means that the molecules are not arrayed in an organized fashion like most solids or crystals. Devitrification is crystallization on the surface of the glass – which sounds like it should be pretty – but it isn’t. It is hard to photograph, but the image below will give you a good idea of what the surface can look like. You can see wipe marks from cleaning show up, and if you look carefully you can see a fingerprint. Example of devitrification which appears as an irregular haze on the glass. There are a myriad of variables involved with the firing of kiln glass that can cause this problem, and at times the exact cause can be elusive. What is even more frustrating is that a project that has been accomplished successfully many times can be ruined by the sudden appearance of devitrification. Below is a table with the general categories of conditions that can promote devit. I will discuss each of them separately. Keep in mind that there is often a combination of factors contributing to the problem in any given situation, for example, you might be firing such a way that you are just on the edge of causing devit, but it doesn’t happen. Then, one time you have a fingerprint on the glass which blooms into frank devit all over the surface of the piece. The firing schedule alone might have been OK, and the fingerprint might have not been a problem – but the two together tips the scale into the devit zone. It is very important to clean all surfaces of the glass before placing them in the kiln. There is some debate regarding the best glass cleaner. I have never used anything but ordinary glass window cleaner and terry cloth rags (washed without fabric softener); but others swear by isopropyl alcohol, distilled water, or their favorite brand of cleaner or paper towels. But, the important concept is to make sure the glass is completely clean to your satisfaction with the products of your choice. Once it is cleaned, handle it by the edges because fingerprints are a common cause of devit. Any glue or adhesive on the surface of the glass can also cause devit. One of the best adhesives for kiln work is Glastac™ – which rarely causes problems, but I would recommend minimizing the amount of any adhesive that you use on the outer surface, or any marking pens – even if you are sure the color will burn off. Any edges or surfaces of the glass that have been worked with a grinder or cut with a tile saw are very prone to devit. Whenever possible perform all cutting with a rotary wheel glass cutter, so all edges consist of smooth untouched glass. The rougher a sawn or ground edge is, the more prone it is to devit, so anything that can be done to create a smoother edge will help. Typical grinder bits are around 120 grit. Getting a 220 bit to use after the rough grinding may be all that is needed to prevent devit. For larger surfaces, such as the flat face of a pattern bar slice, sandblasting before the final firing works well. Some people have good luck with soaking and scrubbing the rough edges with water and vinegar – and this sometimes works, but is not foolproof. In general, devitrification occurs above 1350F. The higher the final process temperature and the longer the glass is in the range above 1300F, the more chance that devit will appear. Keep in mind that above 1150F most of the heat being driven into the glass from the kiln is not from the temperature of the air in the kiln, but by radiant heat from the elements. So, the positioning of the glass relative to the elements is a crucial factor that can explain why glass in one corner of the kiln is fine, but in another corner has devitrified. A firing strategy that can be used is to bring the glass up to the strain point and hold it there until the glass has been uniformly heated, and then fire rapidly to the lowest process temperature that will achieve your desired result, hold for a short period of time, and cool quickly to the annealing hold temp. The key to this schedule is the rapid increase in temperature from 1000F to 1480F. I have gone as fast as 800 dph during that ramp in situations where I was very worried about devitrification. The initial hold can be at anywhere between 1000F and 1250F. You may need to experiment with your kiln and your particular of projects to get a comfort level with this. Paradoxically, aperture pours (pot melts) and high fire slabs, which are often fired above 1600F and held there for long periods of time, usually resist devitrification. This is because the glass is continuously moving, flowing, and presenting new surfaces during the period of time the temperature is very high. Some brands of glass are formulated to minimize devitrification, especially those marketed to kilnformers as “compatible” fusing glass, such as Bullseye, Spectrum and Uroboros. Art glass primarily made for stained glass work and float glass (window glass) is more prone to this problem. Opalescent glass is more prone to devit than is transparent (cathedral) glass. Capping an opalescent glass with a layer of clear or transparent glass is one way to prevent devit. Using clear powder over the opalescent glass may work also. Another method of preventing devitrification on troublesome glass is to use an overspray or flux. These are products that must be evenly applied to the surface of the glass before firing – usually with an airbrush. Examples of these include Spray A, Super Spray, Black Magic, and borax. I am not going to discuss the relative merits of these products, but keep in mind if you choose to use a flux, that some contain lead and should not be used on food bearing surfaces. Also, some will chemically react with certain glasses causing discoloration – always test these products with the glass you are going to use before spraying them on a large or complex project. Whenever glass is brought back to full fusing temperatures there is a risk of devitrification appearing, as if the time above 1350F from the first firing is added to the second. Sandblasting between firings prevents this, as it presents a new, unfired surface. Another strategy is to add another layer of unfired sheet glass or clear glass powder on top of the previously fired surface. We often have material in the kiln other than glass which can cause fumes or impurities in the air. Examples of these materials are fiber paper, Thinfire™ paper, glue, enamel, mold ingredients, whiting, or moisture associated with any of these items. If these products can be avoided it will be helpful – but that is not always possible. Venting the kiln by having the lid or door open a bit as it heats up can help dissipate the fumes. Most organic binders burn off below 800F, so after that the lid can be closed. As mentioned above, factors can combine, causing devit where either alone would not. An example is a ground edge of glass fired adjacent to Thinfire™ paper will often devitrify – but it might not on a kiln washed shelf. In spite of the most scrupulous preparation, sometimes devitrification cannot be prevented. Once it happens, there are various ways to repair the situation. The method of repair will depend upon the particular piece, the equipment you have, and how much time, effort and cost you’ve put into the project. The basic concept is to remove the very outer surface of the glass, which will remove the devit and present you with a new surface. Once this is accomplished the glass can be lightly blasted and firepolished – or left with a matte finish if that is appropriate. An alternative is to cover the devit with another layer of glass, or a thin layer of clear glass powder and refiring. Sandblasting: If possible, this is one of the easiest and most effective methods of removing the devitrification. Obviously, of your piece has a thin surface design that cannot be disturbed, such as enamel, metal luster, printing or iridized glass, this is not a good option. If you are going to place the piece back in the kiln for a firepolish, I would avoid Thinfire™ paper, and I would not blast the bottom side of the piece if you want it to retain the original textured semi gloss bottom surface that you see on most kiln fired glass. Mechanical Grinding: This can be done with diamond hand pads, a center water fed angle grinder, or basically any grinding tool that is the proper shape for the area that needs to be abraded. Usually, grinding with 220 or 400 grit will create a surface that will firepolish nicely. Etching: There are etching creams and chemicals made expressly for etching designs into glass. These can be used to remove the outer layer of glass if a sandblaster is not available. It may require several applications, and it may be difficult to get an even etch depending on the product you use. These chemicals are caustic, and care must be taken to use them safely. Capping with Clear Glass: Adding another layer of glass will often obscure the devit and make the piece perfectly acceptable. This can be done with a 3mm layer, 1.5mm layer, or with clear frit or powder. In addition, several of the oversprays mentioned above contain glass particles in a suspension, and an application of overspray may restore a glossy surface. If additional glass is added, so that the piece is now thicker than 6mm – attention must be paid to the effect it will have on the shape of the glass. It is easier to prevent devitrification than to repair it. With the information in this article you’ll have a good start at understanding why it occurs, and developing strategies to prevent it. The main factors to remember are that the glass must be scrupulously clean, the firing should go to the lowest process temperature that will do the job, and to minimize firing time over 1350F. Bullseye has an excellent video tutorial on devitrification. 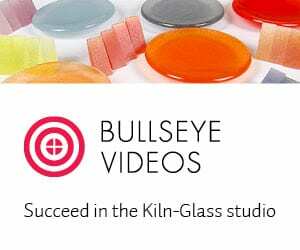 If you would like more information on this topic, I would recommend subscribing to their Online Kiln-glass Education Series. The link below will bring you to their web page. There are also many free instructional videos on that site that are work viewing.